After a big job gain last month, hiring slowed in November. Total employment increased by 155,000 and the unemployment rate remained unchanged at 3.7%. 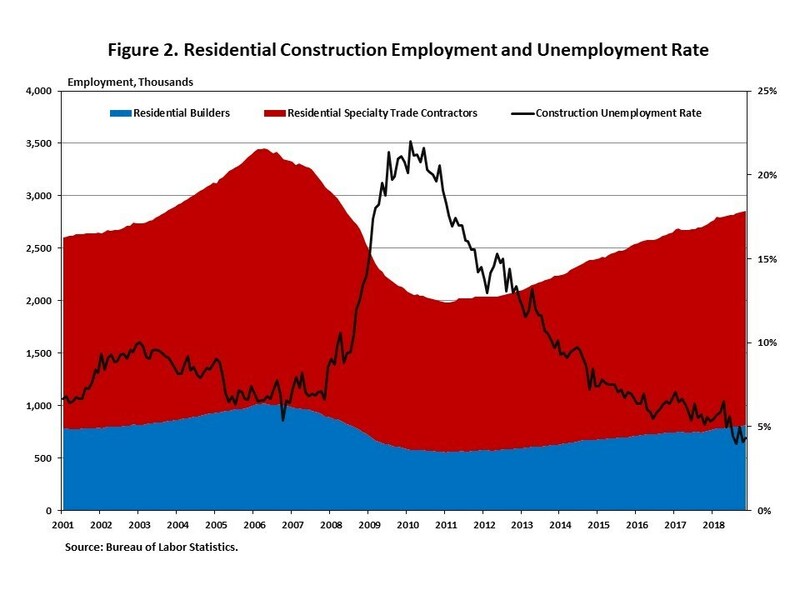 Residential construction employment increased by 7,900 in November. The industry has added 205,000 jobs since 2017. According to the Employment Situation for November released by the Bureau of Labor Statistics, total non-farm payroll employment rose by 155,000, slower than the downwardly revised increase of 237,000 jobs in October. The November increase was lower than an average monthly gain of 209,000 over the past 12 months. Job gains have averaged 206,000 a month in 2018, faster than the first eleven months’ averages of 183,000 in 2017 and 197,000 in 2016. The unemployment rate was 3.7% in November for the third consecutive months, holding at its lowest level since 2001. The number of employed persons increased by 233,000, while the number of unemployed persons was barely changed. In November, the labor force participation rate remained unchanged at 62.9%. The increase in labor force largely reflected the increase in the number of employed persons.